I'm trying to proportionally edit some vertices using the connected mode in the UV/Image editor. According to the Blender manual on proportional editting, I should be able to edit vertices that are both close (in spatial coordinates) while simultaneously ignoring those that are far away topographically. This is not what happens though. It seems as though it edits the vertices with normal proportional edit, ignoring the fact that some of the vertices are far away topographically. Is this the expected behavior for this tool or am I just doing it wrong? Unfortunately proportional editing in the UV editor works differently to the 3Dview. 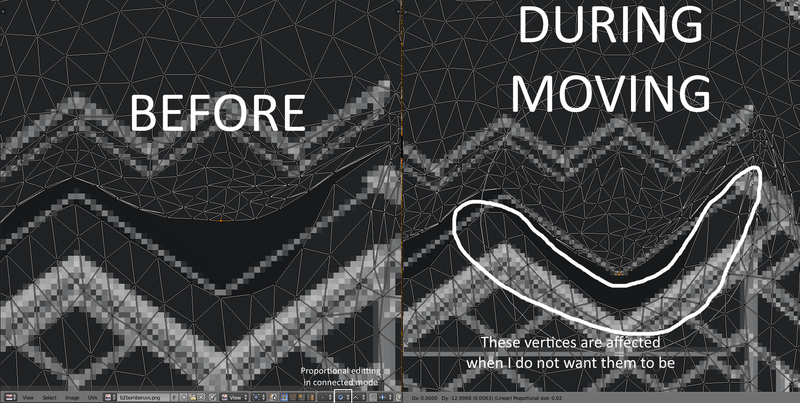 In the 3Dview connected proportional editing will only move vertices that are directly attached to the selected vertices that you are moving. In the UV editor all points that are indirectly connected are influenced by proportional editing. A possible solution is to select only the vertices you want to move (in the 3Dview), the unselected vertices will not be visible in the UV editor and will not be moved when you move the nearby points. Note that this can tear apart neighbouring faces at the edge of the selection. Not the answer you're looking for? Browse other questions tagged transforms vertices or ask your own question. 'Limit selection to visible' suddenly not working in user perspective? Is there a simple way to straighten this line of vertices? How to merge vertices without affecting custom split normals?